The book was okay, bordeline "good," but it could have been better. I thought the writing was kind of dull, the story was a bit repetitive (how many times did we have to hear about mundane things like riding horses, staying at an inn, and eating food? ), and the plot was a bit "meh". I also though Gen was a bit on the whiney side, and found myself apathetic to his fate. But, things really picked towards the end, and I did enjoy the twist the author put in. Still, that was only about 10% of the book, and the other 90% really dragged. 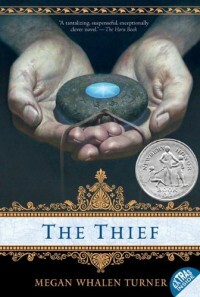 I just read Book 2 in the series (The Queen of Attolia), and I loved it. I'm not going to change my review of The Thief, because I really didn't like this book much, but I will say, Book 2 is pretty great. So, if you're like me and didn't enjoy Book 1, but are willing to give the series another chance, you should definitely do so! Most of my "ugh, this book had so much potential if only..." gripes about this book were realized in Book 2, and it made me oh-so happy.